Caching is useful, because it saves resources by persisting local versions of values, that are in some sense expensive to produce from the original source. Expensive usually means that getting the value takes a relatively long time, which is often the case e.g. when fetching values from a HTTP API. Since C# also has a Task-concept, and async-await syntax, for long lasting operations, caches and Task-objects seem to have a somewhat natural relationship. For a simple cache, there is, of course, no need to reinvent the wheel as .NET provides e.g. System.Runtime.Caching.MemoryCache out of the box. MemoryCache is a very general cache-implementation that we will be using when we implement a special cache that can handle Task-objects. A traditional solution for caching would be to cache the end results of the expensive operations, not the operation-objects (Task-object in this case) them selves. Caching end results can have one problem. Namely, if more than one cache user needs a certain value at relatively same time, some cache users might end up generating the same expensive value simultaneously. Using cache was meant to prevent unnecessary expensive operations! All the (relatively concurrent) cache users will have to first run the expensive operation to get the end result, because the cache remains empty while someone already is generating the value. Then, when all the users of the cache have their own version of the value, they all try to add it to cache, but only the first value will be used and the others will be thrown away. So much expensive value generation done for nothing! Saving non-completed Task-objects to cache displays to all the users of the cache, that generating a certain value has already begun, and thus there is no need to start to generate another one. Also, running the generation is cache's responsibility in this cache implementation. What if the Task-object fails? Task could fail when e.g. a function that retrieves a value over HTTP fails to produce a value because of a network or server error. In practice, an exception is thrown. Caching failed values is called negative caching. Our TaskCache is not a negative cache in the sense, that it does not store tasks that are known to be in a failed state. TaskCache removes failed Tasks, but there is still the problem, that before the Task runs into a failed state, any number of cache users could have gotten it. There is no way of knowing if a Task will succeed, before it actually does. This means that users of the cache can receive failing tasks. Any cache call site, of course, would in any case have to prepare to handle the failures in the value generation, even if there was no cache. Someone would have to generate the value, and no matter where this is done, there is the same risk of a failure. A potential problem with the TaskCache is that a cache call site will now have to prepare to handle the exceptions that could result from the factory functions provided by the call site itself or any other call site. Probably the usual case is that all the call sites, if there even is more than one, use the same factory function, but this does not have to be the case. /// that value will be returned. Otherwise value is first generated with the given method. /// returned task might also have a different origin (from another call to this same method). /// the updateFunc used by any of the caller of this method. /// exceptions that the the updateFunc could throw. /// Invalidate the value for the given key, if value exists. /// Does the cache alrealy contain a value for the key. /// Empties the cache from all entries. At first, AddOrGetExisting might seem a weird function name. I mean, add or get, which is it? What that really means is: I want to get the value for this key. If you don't happen to already have it, here's a recipe how to make it, so that you can make it and then return it to me. So the function name should maybe be GetAndAlsoFirstGenerateAndAddItIfYouDontHaveIt. I chose to use AddOrGetExisting, because System.Runtime.Caching.MemoryCache uses same method name for similar purpose. Note, that this method in MemoryCache returns null, if there was not an existing value. On the other hand, AddOrGetExisting in our TaskCache always returns a value. // that the cache returns (i.e. the awaited task has not been invalidated during the await). // The awaited value is no more the most recent one. // Get the most recent value with a recursive call. // Task object for the given key failed with exception. Remove the task from the cache. // Re throw the exception to be handled by the caller. // A snapshot of keys is taken to avoid enumerating collection during changes. Using MemoryCache provides an out-of-the-box solution for storing objects and value eviction policy and functionality. MemoryCache can for example remove the oldest records from the cache when system memory starts to be used up to a certain level. AsyncLazy is a convenience class for handling Task-objects with Lazy-class. For implementation, check out the complete code at GitHub or the original source. AsyncLazy guarantees that the value generation is only run when actually needed, and not every time someone calls AddOrGetExisting. Every decent implementation comes with a set of tests. These are implemented using NUnit framework. Tests ensure among other things that the value generation is only done when needed. 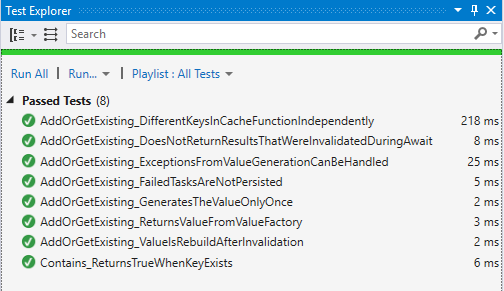 /// Test that the cache returns the value that the valueFactory function generates. /// the same generated value is returned. /// (when eviction policys are not causing changes). // Invalidation should affect only the right key-value-pair. // Use the cache again. /// - Cache user A gets a Task from the cache and starts to await it. /// - While A is awaiting, the value is invalidated. /// - After the A's await is done, A should have a result that was generated after the invalidation, and not the original (now invalidated) result that A started to await in the first step. This "result swich" should be invicible to A. // Wait until the first value get from cache is in the middle of the value generation. // At this point, a Task that is running but not completed has been added to the cache. // CacheUserTask1 is awaiting for the Task to complete. // While the first value get is still running, invalidate the value. // Second get from the cache can now begin. // Because the first (still uncompleted) value was invalidated, cacheUserTask2's fetch should start a new value generation. // New value generation has started but not yet completed. // Let first value generation run to completion. // Let second value generation run to completion. The complete code in a Visual Studio solution is available at my GitHub page.